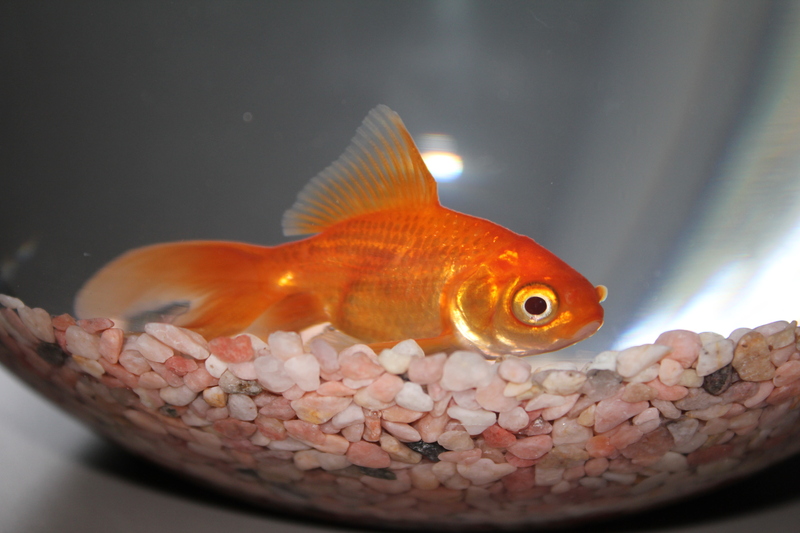 Don’t be fooled by Alan’s happy-go-lucky, goldfish looking exterior. He’s got a heart of steel (along with a tiny brain). For the past three weeks, Alan has deliberately refused to do the one job for which he was purchased to do—swim around in circles and bring happiness to my abode. I’d also killed my third cactus, so I figured it was time to leave the plant life alone and opt for something a little more … hardy. And, clearly, a cat was out of the question. Usually I choose my fish myself, but this time I left it up to the guy at the fish shop (possibly where things were wrong). After washing and cleaning his bowl, I settled Alan in to his new home and waited for him to take to it like, well, a fish to water. But instead, Alan immediately sunk to the bottom of the bowl. Where he held his breath and stared at me. And that’s pretty much all he’s been doing for three weeks. I feel like I’m holding him hostage. At first I thought he was on the brink of death, then I thought perhaps he was depressed from being forced to watch so many B-grade movies while I was on sick leave for two weeks, but after the second week I realised that he’s actually just a prick. Which is when I devised a scheme to catch him out; I’d turn off all the lights and slowly sneak up on him and sure enough, he’d be swimming around like he was in the bloody Commonwealth Games—practically causing a whirlpool in his bowl. The moment I flick on the lights, he’s back to the bottom of the bowl, holding his breath. I’m starting to think it’s also more than a mere coincidence that the moment Alan came into my apartment, my dishwasher stopped working. And the air conditioner started making a funny noise. It’s like he’s a poltergeist. I’m fairly certain I’m going to wake up one morning and he’ll be standing up on his tail on my bedside table waiting to hit me in the head with a saucepan. I should just flush him down the toilet, but I just can’t bring myself to do it. Instead, I’ll continue to hold him hostage see who wins this battle of wits. Given I’m the one with the fish food, I think I might just come out on top (unless he finds the saucepans).